Catholic scholar Brant Pitre has launched a new website. At the top of his homepage he cites one of my favorite passages from Vatican II: "“The study of the Sacred Page…should be the very soul of Sacred Theology” (Dei Verbum 24). Indeed, this directive characterizes all of Dr. Pitre's work--he truly sets out to do biblical theology. Dr. Pitre, a Senior Fellow of the Saint Paul Center, has an exciting new book out, Jesus, the Tribulation and the End of Exile: Restoration Eschatology And the Origin of the Atonement (2006). It has earned high praise from many of the most respected scholars in the guild, including Scot McKnight, David Aune, Dale Allison, and Scott Hahn. Those of you with academic leanings really need to own a copy. Dr. Pitre has also recorded a number of talks on the faith that all audiences will enjoy--scholarly and popular. He has the unique ability to make the complex understandable. He frequently brings audiences to their feet--take it not from me, but from Dr. Hahn. In fact, with Dr. Hahn and Dr. Ted Sri, he ranks among my favorite Catholic conference speakers. Be sure to catch him next weekend at the Catholic Family Conference. Do yourself a favor and check out the audio samples available at his site. The power of the keys recalls the word of God to Eliakim in Isaiah 22:22. Along with the keys, Eliakim receives in trust ‘dominion and control over the dynasty of the descendants of David.’ But the word that the Lord addresses to the doctors of the law and the Pharisees, whom he reproaches for shutting the doors of the Kingdom of Heaven to men (Mt 23:13), also helps us to comprehend the content of this commission logion. As the faithful steward of Jesus’ message, Peter opens the door to the Kingdom of Heaven; his is the function of the doorkeeper, who has to judge concerning admission and rejection (cf. Rev 3:7). In this sense, the significance of the reference to the keys clearly approximates the meaning of binding and loosing. This latter expression is taken from rabbinic language, where it stands primarily for the authority to make doctrinal decisions and, on the other hand, denotes a further disciplinary power, that is, the right to impose or to lift the ban.... If we bear in mind the parallel to the word of the risen Jesus transmitted in John 20:23, it becomes apparent that in its core the power to bind and to loose means the authority to forgive sins, an authority that in Peter is committed to the Church (cf. Mt 18:15-18). This seems to me to be a cardinal point: at the inmost core of the new commission, which robs the forces of destruction of their power, is the grace of forgiveness. It constitutes the Church. The Church is founded upon forgiveness. 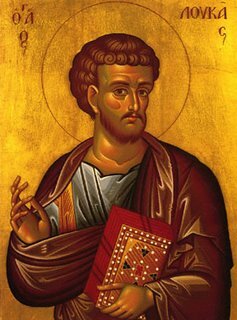 Peter himself is a personal embodiment of this truth, for he is permitted to be the bearer of the keys after having stumbled, confessed and received the grace of pardon. The Church is by nature the home of forgiveness, and it is thus that chaos is banished from within her. She is held together by forgiveness, and Peter is the perpetual living reminder of this reality: she is not a communion of the perfect but a communion of sinners who need and seek forgiveness. Behind the talk of authority, God’s power appears as mercy and thus as the foundation stone of the Church; in the background we hear the word of the Lord: ‘It is not the healthy who have need of the physician, but those who are ill; I have not come to call the righteous, but sinners’ (Mk 2:17). The Church can come into being only where man finds his way to the truth about himself, and the truth is that he needs grace. Wherever pride closes him to this insight, man cannot find the way to Jesus. The keys to the Kingdom of Heaven are the words of forgiveness, which man cannot speak of himself but are granted by God’s power alone. We also understand now why this periscope passes directly over into an announcement of the Passion: by his death Jesus has rolled the stone over the mouth of death, which is the power of hell, so that from his death the power of forgiveness flows without cease. With all the news coverage relating to changes in high ranking Vatican offices, it's easy to forget about those who are really the heart of the Church's mission--parish priests. These are the men who sacrifice their whole lives to the Lord without frills or recognition. These are the men who spend hours in confessionals, who drop all that they are doing to rush to the hospital for a sick call--even at all hours of the night. They devote themselves totally to nourishing the Body of Christ. I want to take the time here to highlight one such priest and the amazing things he has accompished--Fr. George Peter Irving. For the past 13 years, Fr. Peter has served as the pastor of a church in Wilmington, CA, St. Peter and St. Paul Catholic Church. The parish is the second oldest in the entire Los Angeles diocese. When he arrived, the parish was in dire straights. Tucked away in the middle of a downtrodden, hispanic neighborhood near the LA Harbor, the church stood like a tombstone in a forgotten graveyard. At one time, it had been a vibrant community and a beautiful church. Yet, with the passing of the years attendance at Mass went into sharp decline. As gang violence increased, iron bars went up not only on houses, but also around the Lord's house. The gates may have protected the church, but they also seemed to define a barrier between the community and the Lord they came to worship. By the time Fr. Peter arrived in 1993, the church was virtually in total disrepair. Dark, dreary and empty--the physical condition of the church in many ways represented the spiritual state of the community. The confirmation program puttered along with only a handful of students. The financial state of the parish was miserable. The baptistry had been turned into a makeshift closet and the bells in the ancient steeple had been gone for decades. But Fr. Peter had a vision. For one thing, he started a youth program, which involved door-to-door evangelization. He walked through the government projects and befriended the gang bangers. He passed out holy cards. He knew names, faces and families. It wasn't safe. His family and friends feared for his life. But at 11pm at night, he was back out there night after night. He found other youth who assisted him in his ministry. One year after he arrived, the Bishop came to confirm 200 young people. And it wasn't just young people who came back to the parish--it was their families as well. Empty Masses became packed until there wasn't even standing room. Confessional lines began to meander outside the church doors. He also painted the church and started a massive restoration project. With careful planning, Fr. Peter stretched every dollar he received. Every pew was carefully restored. So was the marble, the altar, the statues, the stations, etc. Those old bells were restored and sounded once again. Children were once again baptized in the baptistry. In a bold move, he removed the gates around the church. People warned him that kids would vandalize the church. He told them they knew better and that even if they did, it could always be fixed. But there was never a need to--no one did the church any harm. (Though graffiti marked just about everything else in the neighborhood.) He replaced the gates with benches, planted new grass, and suddenly the church looked like a miraculous preserve of sorts. If you build it, they will come. They did, and in droves. Since Father Peter has arrived, the collection has tripled. Fr. Peter then laid out another careful plan--"On the Verge of a Miracle"--to build a parish center. The poor hispanic community went on to raise over a million dollars to build the parish hall they never had but desperately needed. And this was no concrete box--this was a beautiful hall, which included all kinds of high-tech features you would never expect to find in Wilmington. Fr. Peter found a way to stretch every penny. Moreover, the hall was carefully designed to look as though it had always been there, matching the church's design perfectly. The hall is also home to Saint Joseph's Bookstore, one of the best Catholic bookstores in all of southern California. The selection there is truly overwhelming. You can find there just about any Ratzinger title you can think of, as well as church documents, writings of saints and doctors, as well as other contemporary theologians and authors such as Henri De Lubac, Jean Cardinal Danielou, Reginald Garrigou-Lagrange, Yves Congar, John Saward, Scott Hahn, Aidan Nichols, Mike Aquilina, Benedict Groeschel, Romano Guardini, etc. The great theology in the bookstore should give you an idea of the caliber of Fr. Peter's preaching. I could go on and on about how wonderful St. Peter and St. Paul Church has become. I could tell you about the beautiful John Paul II park, built in the corner of what was once an abandoned lot next to the church parking lot. I could tell you about how Fr. Peter taught the bilingual community a good bit of Latin, so that they could pray together. I could tell you about the brand new adoration chapel, which brings in worshippers at all hours of the day and night--in fact, the local news stations did a piece on how remarkable it was. And we haven't even discussed the amazing state of the parish school. To recount everything that has happened would truly take a full length book. Suffice it to say, Fr. Peter has transformed the community. People now talk about how violent Wilmington used to be. They can't remember a time when there was no adoration chapel, or hall, or confessional lines out the door. The church website has tons of pictures and stories--you can even see a month by month photo chronicle of the building of the hall (to right of the photo albums you will find arrows which take you to the "next" page--scroll right). This week, Fr. Peter leaves the parish for a new assignment. Last Saturday the parish came out to thank him--people waited 3 hours in a line that stretched around the church, through the parking lot and into the hall, just to shake his hand and take picture with him. There were many tears and sad faces. Some of the people in line were members of that first confirmation class who brought their kids--kids who Fr. Peter had baptized--to be blessed by him one more time. Others were more recent "re-verts" to the faith. Even some gang bangers came to say goodbye with tears in their eyes. 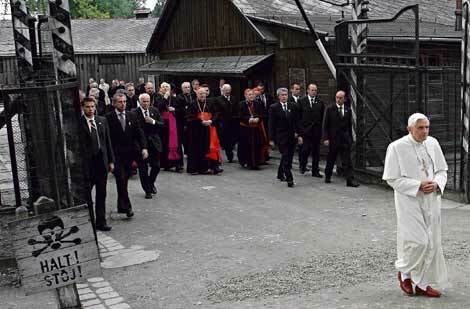 Frankly, I think it's a shame that priests get moved like this. In fact, Fr. Peter's wonderful associate pastor, Fr. Roberto, is also moving this week. I don't think pastors should be "transferred" like managers of a franchise fast food chain. They are spiritual fathers--and fathers are not simply to be transferred after a term limit. Regardless, Fr. 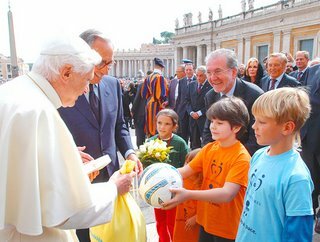 Peter has shown how Catholics can realize impossible dreams for their parish in Christ. What an inspiration. One more thing, Fr. Peter is my uncle. I am so proud of all that he has accomplished at Sts. Peter and Paul. I can't tell you how sad it is to watch him leave this community. But I also look forward to watching him do it all over again at the next place he is headed. I'll keep you updated. Please keep him in your prayers this week and in the future. Sts. Peter and Paul, pray for us. The eminent Christian scholar Scot McKnight has a post up on how to read the Bible. He mentions different hermeneutical views that stress the unity of the Bible, such as Brevard Childs' canonical approach. He goes on to mention the Founder of the Saint Paul Center, Scott Hahn. America’s best scholar on covenant Bible reading is Scott Hahn, the former evangelical now Catholic theologian. His dissertation at Marquette was all about coveanant, and he wrote a book called A Father Who Keeps His Promises, but he is now at work on a big-time book on covenant theology. I’m really excited about what he will propose. McKnight is always interesting to read and exemplifies Christian charity in his scholarship. Be sure to read the rest of his post. "From the earliest days of the church, the reading of Scripture has been an integral part of the Christian liturgy, an inheritance to some extent from the liturgy of the synagogue. Today, too, it is above all through the liturgy that Christians come into contact with Scripture, particularly during the Sunday celebration of the Eucharist. 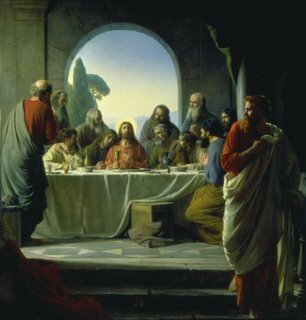 "In principle, the liturgy, and especially the sacramental liturgy, the high point of which is the eucharistic celebration, brings about the most perfect actualization of the biblical texts, for the liturgy places the proclamation in the midst of the community of believers, gathered around Christ so as to draw near to God. Christ is then 'present in his word, because it is he himself who speaks when sacred Scripture is read in the church' (Sacrosanctum Concilium, 7). Written text thus becomes living word. "The liturgical reform initiated by the Second Vatican Council sought to provide Catholics with rich sustenance from the Bible. The triple cycle of Sunday readings gives a privileged place to the Gospels, in such a way as to shed light on the mystery of Christ as principle of our salvation. By regularly associating a text of the Old Testament with the text of the Gospel, the cycle often suggests a Scriptural interpretation moving in the direction of typology. But, of course, such is not the only kind of interpretation possible." --From the 1993 document, The Interpretation of the Bible in the Church (IV, C, 1), issued by the Pontifical Biblical Commission. Bart Ehrman is a biblical scholar who has recently written a book called Misquoting Jesus: The Story Behind Who Changed the Bible and Why (San Francisco: HarperSanFrancisco, 2005). 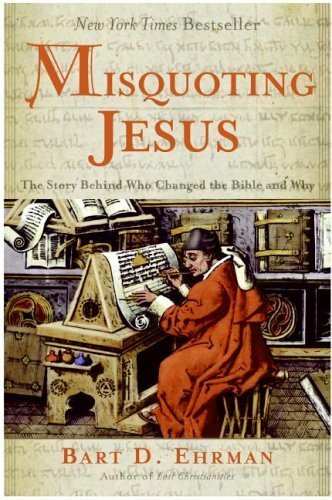 The basic thrust of his argument is that the Bible is unreliable--we simply do not know what Jesus really said, he argues. Ehrman has been making the rounds of various television shows, doing interviews about the book. This week he appears on the Colbert Report--a show on Comedy Central. Now, I don't know what Steven Colbert really believes--he never seems to be serious about anything. In fact, he recently got himself into a lot of controversy when he addressed the White House Correspondence dinner, where he took the opportunity to make some rather sharp criticisms of the President, who was present. Normally, speakers check politics at the door and act as cordially as possible. Colbert did not pull punches though. Supporters of the President said it was inappropriate--critics of the President thought it took a lot of guts. Rocco apparently thinks he may be a devout Catholic. In any event, Colbert took on Ehrman and his agnostic approach. Colbert takes the position of someone who believes the Bible is the inerrant Word of God. I don't think Ehrman expected Colbert to ask him the questions he did. One scholar has said Erhman looked like a "deer in the headlights." You've got to watch the interview. Go here to see it--be sure to hit the link there for Bart Ehrman. I think Colbert was a bit rude to Ehrman, but, at the same time, Colbert acts this way to all his guests--it's part of his schtick. Erhman probably shouldn't have been surprised he got made fun of--Colbert makes fun of everyone. Actually, this was a lot of fun. 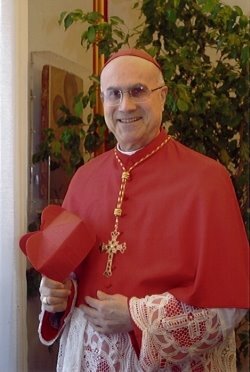 It's official--Cardinal Bertone is going to be the new Secretary of State for the Vatican. To learn all about him, check out this earlier post, which has tons of links and information about the good Cardinal. It was also announced today that the Pope has accepted the resignation of Cardinal Edmund C. Szoka, the President of the Vatican City State. Taking his place will be Archbishop Giovanni Lajolo. An address exemplary of this tendency [i.e., reciprocity] is found in the one Lajolo delivered last May 17 at the session of the Pontifical Council for the Pastoral Care of Migrants, dedicated to Islam. In it, Lajolo gave center stage to religious liberty, demanding reciprocity in comprehensive respect for this freedom: in the Muslim-majority countries as well as those with a Christian majority. -- Faced with Islam the Church is called to live its own identity to the full, without backing down and by taking clear and courageous positions to affirm Christian identity. Radical Islamists, the prelate warned, take advantage of every sign they interpret as weakness. -- We should also be open to dialogue, whether with individual nations or within the United Nations or other organizations. -- An underlying problem in dealing with Islamic nations is the lack of separation between religion and the state. Part of the dialogue with Islamic religious and political authorities should be aimed at helping to develop a separation between these two spheres. -- A particularly sensitive point is that of respect for minorities and for human rights, especially religious rights. The Holy See will continue to speak out at international meetings for the human rights of migrants. For its part the international community should ensure that humanitarian organizations do not unduly pressure recipients of aid to change religion. -- The Holy See will continue to declare its firm opposition to all attempts to exploit religion by using it to justify terrorism and violence. -- The protection of Christians in Islamic countries is particularly difficult in the area ranging from Turkey to the Middle East. Solutions must be found for the many Christians who flee their country of residence in search of safety. -- Muslims who live in predominantly Christian countries should be integrated into the nation. -- The Catholic media can play an important role in educating Christians, including those living in Islamic countries. -- The Roman Curia together with bishops' conferences and local churches need to work closely together in these matters, including looking at the way to spread the Gospel in the Islamic world. This is our duty and our right, concluded Archbishop Lajolo. Here's the whole text of that speech. In addition, here's an interview he did with John Allen in 2004. The interview was noteworthy because in it Lajolo seemed to acknowledge some validity to the "Bush-doctrine" of preemptive action taken against nation states that support terrorism--though he insisted any such act should be carried out with U.N. approval. Here's a story on that. 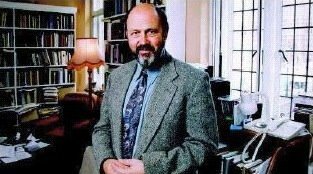 I ran across this quote from a 2002 interview with N. T. Wright. Read the rest over at http://religion-online.org/showarticle.asp?title=2636. Catholic blogger and journalist Domenico Bettinelli points out an article over at Chuck Colson's website which discusses the ability of science fiction (specifically the new Battle Star Galactica) to address poignant issues and to make interesting social commentary. As the new professor at a school which has a focus in Media, one of my goals will be to show my students how theological and moral issues can be dealt with in fictional narrative. One of the most successful means used in the past to tackle these subjects has been science fiction. Many Christian writers, such as C. S. Lewis, have used science fiction to communicate profound truths. But non-Christians have frequently stumbled into some interesting questions as well. The genre truly opens up all kinds of fascinating avenues for discussion. In the 1960's Gene Roddenberry used Star Trek to make some very strong statements regarding social issues like racism. In the episode, "Bread and Circuses" (1968) there are also some specific things said related to Christianity's influence in world history. Starting in the 1970's, George Lucas' epic trilogy Star Wars also had religious connotations. An evil emperor seeks to destroy a religion that has been forced to go underground after an imperial persecution. At the center of the story is a broken family which had been torn apart by hatred and wickedness. The climactic end of the trilogy involves a battle that is fought on three fronts: one on the ground, one in space (in the heavens) and one in which a son shows himself willing to die before being delivered by his father. It is certainly no exact parallel to the New Testament, but much of it sounds familiar. And, if you really think about, the differences are as noteworthy as the parallels. In the 1982, Disney released a science fiction movie that also had theological implications. 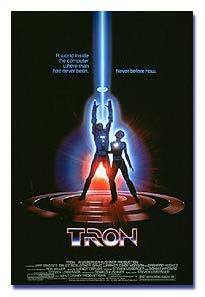 Tron follows a computer programmer (Jeff Bridges) who gets taken into his own created computer programmed world. This, of course, was years before The Matrix. You ought to check Tron out if you already haven't. It was a major technical breakthrough for its time--like Star Wars, I think it has an amazingly original look and feel. The article written at Colson's site by Alex Wainer looks at how Battle Star Galatica tackles the abortion issue. It reminded me of the 1991, Star Trek: The Next Generation episode called "The Masterpiece Society." The Enterprise comes to the aid of a planet in which every child born is genetically perfect. The planet is facing utter extinction due to some space phenomenon. The answer to their problem is discovered by Geordi LaForge, a blind character who uses a space-age "VISOR" to enable him to see. The way out of the impending doom lies in the technology of the VISOR. The irony is quite bitter. The scientists are genetically engineered geniuses, but since they never had to faced certain limitations or challenges they also never developed certain technologies or learned to think creatively. The most poignant part of the episode is when LaForge looks at one of the scientists and says, "On your planet, I never would have been born." To underscore the point the story is making, the episode opens with one of the characters playing a simulated game of poker with Steven Hawkings (who plays himself). (Yes, yes, I know all about Hawkings recent cheap shot at JP II). The point is that in a genetically engineered society, Hawkings would never have been born. I'd love to hear anybody else's thoughts on this. What movies and tv shows (give the name of the episode, not simply "the one about") can you think of that deal with these types of issues? By the way, speaking of sci-fi, did you know that as part of their rigorous seminary training priests must now learn how to handle a lightsaber? Neither did I--but from this video of two seminarians engaged in a duel it is apparently true that they do. I wonder if those seminary investigations will shed any light on this aspect of the priestly formation. (By the way, I always thought Luke Skywalker's Jedi clothes looked rather like priestly clerics.) Hat tip to American Papist for the video. I am preparing for a class I am teaching in the Fall on the Gospel of Luke. Do any of you--especially any of you who are professors--have any textbook suggestions? I know I would definitely like to use the Luke volume from the Ignatius Catholic Study Bible series. In addition, I am also considering recommending a more technical commentary. I might just leave students with options--that would certainly help to generate some interesting class discussion. Fitzmyer, Evans, Bock, Johnson, Marshall--there are just so many to choose from. Any comments? The 16th annual National Catholic Family Conference is soon approaching. I hope to see many of you there! If you need information, go here. It is with great joy and humility that I can announce that I have received the Bishop’s mandate to teach Theology at John Paul the Great Catholic University. What exactly is the mandate? The mandate is prescribed by the Code of Canon Law 812: “Those who teach theological disciplines in any institutes of higher studies whatsoever must have a mandate from the competent ecclesiastical authority.” In most cases, the “competent ecclesiastical authority” means the local bishop. The mandate, therefore, is the permission the Bishop grants to teach theology. The mandate therefore ensures that Catholic teaching is truly taught at Catholic schools. The Bishop is responsible for making sure that those who teach theology are in union with the Church’s teaching. Some theologians did not welcome the Pope’s words. They insisted that the mandate infringed on their academic freedom—a freedom they argued was necessary to do true scholarship. Some argued that the mandate would cause a rift between the Church and academia. Actually, the mandate makes true scholarship possible. In fact, one cannot do theology properly without the Church. The word “theology” literally means the study of God. Theology is not just another academic discipline. It is not simply the result of scholarly curiosity. Theology entails learning about God. How do we learn about God? After all, the truth about who God truly is cannot be discovered by reason. Philosophers can determine that God exists, but that’s only as far as natural reason can get us. It is only through divine revelation—what God reveals to us— that we know who God is. The source material of theology, therefore, is divine revelation. Throughout history, God made himself known to his people “in many and various ways” (cf. Heb. 1:1). The fullness of God’s revelation is given to us in Jesus (cf. John 14:9). In Jesus, God reveals to us who He is; He is the definitive Word of God (cf. John 1:1-3). Theology therefore centers upon Christ. Jesus entrusted His teaching to the apostles, whom he commissioned to preach and teach in His name (cf. Matt 16:18-19; 28:19-20). He tells them, “He who hears you, hears me” (Luke 10:16). The apostles communicated the teaching of Christ through their preaching, which was transmitted “by word of mouth” (through oral tradition) and “by letter” (Sacred Scripture) (cf. 2 Thess 2:15). "The teaching of the Church has indeed been handed down through an order of succession from the apostles and remains in the churches even to the present time. That alone is to be believed as the truth which is in no way at variance with ecclesiastical and apostolic tradition" (The Fundamental Doctrines 1:2). It is through the Bishops, the successors of the apostles, in union with the Pope, the successor to Peter, that Christ’s teaching comes to us. Moreover, it is through the Magisterium that we know which books God has inspired. The Bible doesn’t tell us which books were written under the inspiration of the Holy Spirit. We receive the Bible through the Church—not because the Church creates Scripture, but because God uses the Church to show us what belongs in it. Through the Church we receive what has been divinely revealed to us—in Scripture and in Tradition. Theology, which studies who God is by examining what he has revealed about himself, is therefore inseparable from the Church. As Catholics we believe that Christ is the definitive revelation of God, and his teaching comes to us through the Church. One cannot hope to do theology properly without the Church. 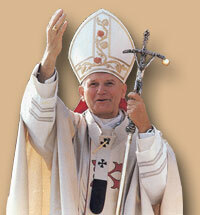 The Bishop, as a successor to the apostles, is therefore the primary teacher of the faith and theology. He continues the mission first entrusted to the twelve—to teach in His name. Those who do theology therefore are subject to the Bishop. Again, this reflects the practice of the earliest Christians. Ignatius of Antioch in A.D. 110 writes, "Let no man do anything connected with the Church without the bishop" (Letter to the Smyrnaeans 8). In teaching the faith theologians do not act independently—their proper role is one of assisting the bishop in his teaching mission. Our society defines freedom in terms of the being “from”; but true freedom entails being free “for”. The moral theologian Servais Pinckaers uses the analogy of playing the piano. Imagine you wanted to learn how to play piano. Now imagine that you told your professor that you wanted to be free—free from any musical theory, from any knowledge of notes and arpeggios, free to hit any key you wanted. Would you be “free” to play piano? No. You would just be making noise. Perhaps some people today call random noise music—if that’s what you’re interested in doing, well, go ahead and start banging away (just let us all get our ear plugs in before you begin). But if you really want to learn how to play piano—if you want to be truly free to play anything you want—I’m afraid you’re going to have to submit yourself to your piano teacher. The same thing can be said of theology. The Teaching Magisterium does not make us less free. Freedom to teach error is not true freedom. Guided by the light of Faith, our minds our elevated to think with ever more clarity. Faith does not contradict reason, rather, it takes us beyond our natural capabilities. Faith sets us free. True freedom is faith in Christ Jesus. I am grateful for the confidence the Bishop has shown in me in granting me the mandate, which entails the privilege of assisting him in his apostolic mission. I eagerly look forward to the coming Fall quarter—JP Catholic’s first—and to the opportunity to help form the leaders of tomorrow in their understanding of who God is. May our Lord grant us His grace, enlightening our minds and opening our hearts to His Word—setting us free to learn and to live the Faith. The Greek word for “God” is “theos.” As “sociology” is the study of the “social,” and “psychology” is the study of the human psyche, “theology” is the study of God. Those who do theology must be ever-vigilant that they do not end up simply doing “theologianology”—the study of other theologians. While learning about what other great minds have said about who God is and what he has done, they are ultimately not the ultimate subject of study. The true focus of theology must always be God himself. The Nature and Mission of Theology: Appraoches to Understanding Its Role in the Light of Present Controversy (San Francisco: Ignatius, 1995), 61. Another "dogma" of critical biblical scholarship is being called into question. For some time now, scholars have questioned the biblical description of the Edomites. In Scripture, they are described as enemies of ancient Israel--yet many scholars dispute whether or not they even existed as a state at the time. An international team of archaeologists has recorded radiocarbon dates that they say show the tribes of Edom may have indeed come together in a cohesive society as early as the 12th century B.C., certainly by the 10th. The evidence was found in the ruins of a large copper-processing center and fortress at Khirbat en-Nahas, in the lowlands of what was Edom and is now part of Jordan. Thomas E. Levy, a leader of the excavations, said in an interview last week that the findings there and at abandoned mines elsewhere in the region demonstrated that the Edomites had developed a complex state much earlier than previously thought. Dr. Levy, an archaeologist at the University of California, San Diego, said the research had yielded not only the first high-precision dates in the region, but also such telling artifacts as scarabs, ceramics, metal arrowheads, hammers, grinding stones and slag heaps. Radiocarbon analysis of charred wood, grain and fruit in several sediment layers revealed two major phases of copper processing, first in the 12th and 11th centuries, later in the 10th and 9th. This seems to confirm the biblical account--and cast a lot of doubt on the theories many critical scholars have held regarding the Edomites. With the addition of new dates and more evidence of the importance of copper in the emergence of Edom, the two archaeologists have amplified their interpretations in an article being published this month in the magazine Biblical Archaeology Review. "We have discovered a degree of social complexity in the land of Edom," they wrote, "that demonstrates the weak reed on the basis of which a number of scholars have scoffed at the idea of a state or complex chiefdom in Edom at this early period." this supported the tradition that Judah itself had by the time of David and Solomon, in the early 10th century, emerged as a kingdom with ambition and the means of fighting off the Edomites. The legal problems continue for Dan Brown, who looks to face more charges of plagiarism, this time for borrowing from a book by a man named Lewis Perdue, Daughter God. 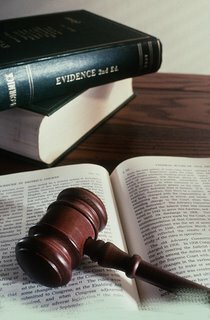 The two libel experts say they are convinced Brown borrowed heavily from the Perdue book, despite Brown's recent victory in court. John Olsson, the director of Britain's Forensic Linguistics Institute, has said, "This is the most blatant example of in-your-face plagiarism I've ever seen. It just goes on and on. There are literally hundreds of parallels." Brown did not respond to requests for comment from Vanity Fair. Mnookin also cites an incident in which Brown copied for "The DaVinci Code" an exact passage from the paper "Leonardo's Lost Robot," written by robotics expert Mark Rosheim. Brown's publisher, Doubleday, said it was covered under fair-use. Rosheim says, "Every now and then I'll be giving a talk and someone will come in with The Da Vinci Code and ask me to sign a copy. Either that or they'll accuse me of copying him." Finally, Mnookin offers evidence that he says may link Brown's wife, Blythe, to a spate of "mysterious" e-mails that Perdue has received, coming from one "Ahamedd Saaddodeen." "Paul says that just as Jesus is seated in heavenly places, so also in Him we are seated in heavenly places. We shouldn't think that someday in the postmillennial future, Christians will begin to rule. We should instead realize that we rule now. This is a strange kind of rule, a rule that no one else acknowledges, a rule that is not based on power or apparent influence, a rule that can appear to have very little effect on the world around us. But the gospel says that it's true, and we have to live in terms of what God says is the case and not in terms of what we can see is true. "And that is part of the glory of this table. Calvin raised the question of how we can feed on Christ when He's in heaven and we're on earth, and one of his answers was that the Spirit catches us up to heaven to be with Christ. This is no earthly table; this is a heavenly table, where we sit to eat and drink in the kingdom of God. But sitting is also the posture of rule, the posture of kings, the posture of judges. Because of Jesus' ascension, this is a table for kings and queens, princes and princesses. This is a table for those who have, in Christ, ascended to heavenly places and entered the heavenly tabernacle. Because of Jesus' ascension, we have been given a kingdom, the right to eat and drink and the authority to judge the 12 tribes of Israel." The images used by St. Luke to indicate the irruption of the Holy Spirit -- wind and fire -- recall the Sinai, where God revealed himself to the people of Israel and offered his covenant (cf. Exodus 19:3 and following). The feast of Sinai, which Israel celebrated 50 days after the Passover, was the feast of the Covenant. On speaking of the tongues of fire (cf. Acts 3), St. Luke wants to represent Pentecost as a new Sinai, as the feast of the new Covenant, in which the Covenant with Israel is extended to all the nations of the earth. The Church has been catholic and missionary from her birth. The universality of salvation is manifested with the list of the numerous ethnic groups to which those belonged who heard the apostles' first proclamation (cf. Acts 2:9-11). The People of God, which had found its first configuration in Sinai, extends today to the point of surmounting every barrier of race, culture, space and time. As opposed to what occurred with the tower of Babel, when people wanted to build a way to heaven with their hands, they ended up by destroying their very capacity to understand one another mutually. The Pentecost of the Spirit, with the gift of tongues, shows that his presence unites and transforms confusion into communion. Man's pride and egoism always creates divisions, builds walls of indifference, hatred and violence. The Holy Spirit, on the contrary, makes hearts capable of understanding everyone's languages, as it re-establishes the bridge of authentic communication between earth and heaven. The Holy Spirit is love. 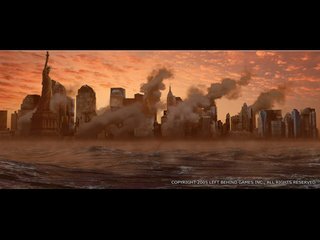 I didn't believe it until I saw it for myself -- "Left Behind" is now a first person "shooter" video game. That's right, the Parousia is coming. And what is your role exactly?--Shoot to kill. I'm not kidding. Here's the description of the new game, "Left Behind: Eternal Forces," from a recent LA Times story. "In the game, Tribulation squads unleash the usual arsenal against the Antichrist: guns, tanks, helicopters. But soldiers lose some of their spirituality every time they kill an opponent and must be bolstered through prayer. The failure to nurture good guys causes their spirit points to drop, leaving them vulnerable to recruitment by the other side." If that's not bad enough, it gets worse. When you kill one of the bad guys, your player exclaims: "Praise the Lord!" I have always enjoyed working with and learning from non-Catholics Christians. As I have explained on this blog, as a Catholic student at APU and Fuller Theological Seminary, I have had the wonderful opportunity to learn from some of the most gifted Christian scholars around. Of course, every now and then, I encounter someone on campus who, upon hearing of my denominational affiliation, determines that God has called them to "save" me from the errors of Catholicism. I've heard just about every argument against the Catholic Church you can imagine--from "call no man father" to the charge that Catholic epistemology is essentially "foundationalist". One that I recently encountered focused on the sacrament of Baptism. My non-Catholic friend insisted that Jesus did not call us to be baptized but simply to be "born again"--by which he meant making an interior committment to Christ. I do not dispute the need for interior committment--that's of the upmost importance. But did Jesus really say that we need to be "born again"? That's what I want to focus on here. I asked my friend where Scripture tells us about being "born again" and he said, "John 3:3: "I truly, I say to you, unless one is born again [anōthen], he cannot enter into the kingdom of God." I told him he was making the same mistake Nicodemus made. Let me explain. Jesus goes on to explain: "Truly, truly, I say to you, unless one is born of water and the Spirit, he cannot enter the kingdom of God. That which is born of the flesh is flesh, and that which is born of the Spirit is spirit. Do not marvel that I said to you, "You must be born anōthen" (John 3:5-7). After comparing the Holy Spirit to the invisible movement of the wind, Jesus says, "If I have told you earthly things and you do not believe, how can you believe if I tell you heavenly things? 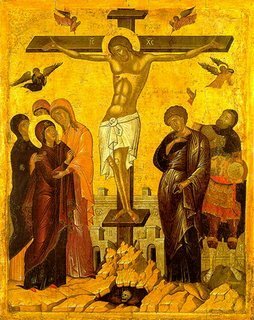 No one has ascended into heaven but he who descended from heaven, the Son of Man" (John 3:12-13). I wonder if it might be more in line with Jesus' teaching to speak of "Born From Above Christians," and not "Born Again Christians"? Regardless, what is often missed in this whole narrative is the underlying baptismal imagery: "Truly, truly, I say to you, unless one is born of water and the Spirit he cannot enter the kingdom of heaven" (John 3:5). There is clearly a reference here to Ezek 36:25-28. But, to my mind, it is impossible to imagine that John's first readers would not have seen this as a reference to baptism. In fact, water and the Spirit have previously been linked together earlier in the Gospel--at Jesus' baptism (1:31-33). In fact, immediately after this episode we read: "After this Jesus and his disciples went into the land of Judea; the he remained with them and baptized" (John 3:22). Jesus wanted us to be born again, that is, born "from above" through the Spirit in the sacrament of baptism (cf. Matt 28:19).